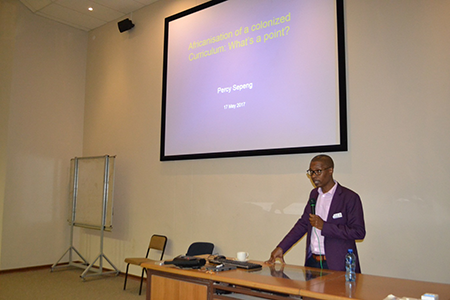 The Faculty of Education and Training at the North-West University’s (NWU’s) campus in Mahikeng recently hosted a colloquium on “Africanisation of the Curriculum”. The colloquium organised by the faculty’s Public Lecture Committee took place on 17 May 2017. The colloquium highlighted the critical issues for African people in search of a common ground in terms of their sense of belonging, pride and identity in the work context and in the world. The colloquium boasted eye-opening presentations by panelists and lively participation by the audience. Mr Enos Makhele, a lecturer, Prof Percy Sepeng, a school director in the faculty, and Dr Shadrack Mvula, chief director at the North West Province’s Department of Education, served as members of the panel. During the discussions, Prof Sepeng said that Africanisation is not an exclusive process but rather an inclusive one. “It is characterised by integration, adaption, transformation and incorporation within the contexts of multiple cultures.” He also urged academics to – instead of just talking about Africanising the curriculum – to turn their focus to the decolonising thereof. Prof Percy Sepeng doing his presentation on Africanisation of a Decolonised curiculum. 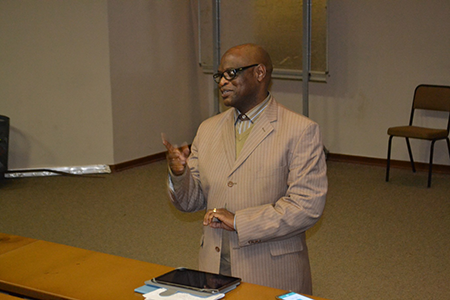 Dr Shadrack Mvula, chief director at the North West Province’s Department of Education.